Many people like to fish for themselves and their family for economical or leisure purposes. In fact, there are plenty of individuals that use fishing to provide food for their families, allowing them to be frugal. Whether you're camping or fishing nearby, cleaning, gutting, and scaling a fish isn't as complicated as it might seem. After you've caught your fish, make sure to let your fish hang on the stringer in the water, and then put it in a cooler full of ice water. This will keep your fish fresh and flavorful. You want to either freeze it for dinner later or start preparing it immediately so you can eat it fast. Try to aim for cleaning your fish within 1-2 hours so it doesn't spoil. Plus, dried out fish will make the scales harder to remove come clean time. Find a spot outside or in a place where you can clean up easily, as the scales will go flying. Then, grab the easiest tool to scale a fish with: a butter knife. They make special scalers you can purchase, but you don't need one. 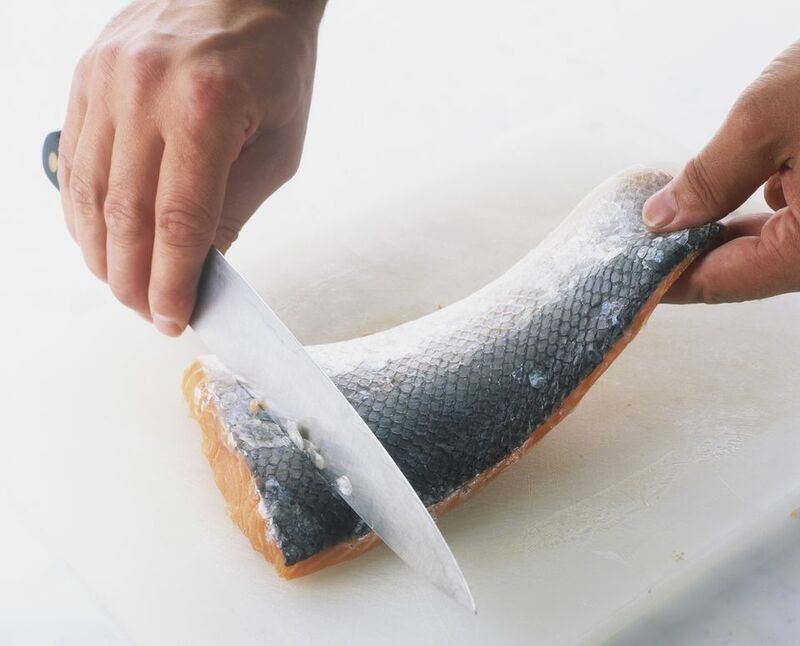 Start scaling your fish by holding it firmly with one hand and scraping from tail to head with the knife. Make sure you get the scales on the top of the fish and near the fins, remembering to clean the tail. Try not to press too hard or gash the fish, and be careful around the fins as they can prick the skin. Don't forget about the collar of the fish. This is often the tastiest part but often skipped over entirely. Start the gutting process by slipping the tip of your fillet knife into the vent. Slice upwards, away from the fish and the guts, and toward the head. Complete the cut by forcing the knife through the bony portion. This part lies between the pelvic fins (that are paired up on the belly of the fish) and the base of the lower jaw. Remove the guts by reaching in and grabbing them right at the base of the head, where you feel everything connect. Pinch that spot and pull the whole lot out. On large fish, you will have to carefully cut this with your knife. Scrape out the liver attached to the backbone of the fish. 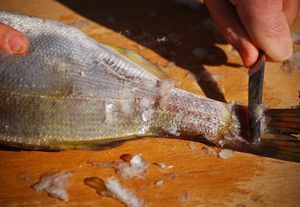 Then, cut out what remains of the swim bladder, which is a white sack that attaches itself to the cavity. The gills will impart a bitter flavor to your fish and will make it spoil faster. Remove the gills by cutting them where they attach at either end of the arc that they form. You can use kitchen shears or a knife. On small fish, you can even just rip them out. Once the attachments are cut, you can remove the gills. Then, wash the scaled and gutted fish well in ice-cold water. Pack on a bed of crushed ice until you're ready to cook it.